It's all up to Gordon now. His partner has been captured. His superior officer has been neutralized. And his distress calls to P.U.R.S.T. (Pets of the Universe Ready for Space Travel) have gone unanswered. That means he must fight the aliens alone! But Gordon's not a fighter --- his deadliest weapon is his mind. So what's a genius dog to do? Time travel, of course! He'll use his new time machine to travel back in time, then he can stop the invasion before it happens. But there's a malfunction: instead of sending him back five days, the time machine sends him back five years! And now he's out of fuel! With only his wits to depend on, can Gordon get back to the future in time to save his friends and his humans? This laugh-out-loud junior graphic novel is part of Ashley Spires's hugely popular P.U.R.S.T. Adventure series. 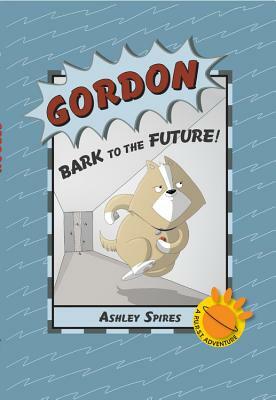 Gordon the dog is a favorite character from Spires's companion series about Binky the cat. Not too text-heavy, these titles are perfect for emerging readers, though the nonstop action, melodrama and physical comedy make them popular with all children (and adults, too!). With lots of details to look for in the artwork --- such as hilarious sound effects and animal facial expressions --- these titles are terrific for developing visual literacy in beginning readers. This story showcases the character education attributes of responsibility, courage and perseverance. Ashley Spires grew up in the Pacific Northwest, the supposed stomping grounds of Bigfoot. She is the author and illustrator of a number of books for children, including Small Saul and the Adventures of Binky the Space Cat. She was the recipient of the 2011 Silver Birch Express Award and the 2011 Hackmatack Award for Binky the Space Cat and was shortlisted for a Joe Shuster Comics for Kids Award and an Eisner Award for Binky Under Pressure. Ashley currently lives in British Columbia.